MERCIFULLY we can pass over the horrors of the Marian persecutions, whose only effect was to stiffen the broad back of England against the Pope, and profoundly to deepen our national Protestantism. We are concerned here only with the history of a single book, and we therefore turn at once to the Third Act of Uniformity, in the year after Elizabeth's accession. The Latin services had of course been used in Mary's reign. She had restored the Sarum rites: the Roman ritual was not introduced among the English Papists till early in the 17th century. 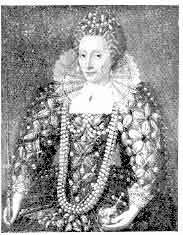 On November 17th, 1558, Elizabeth came to the throne; and measures were at once taken for the restoration of the Prayer Book. Naturally but unfortunately the Second Book held the field. Queen Elizabeth, who sided with the small but sensible moderate party, was determined that at least that Book should be relieved of some of its worst features. In April, 1559, the Elizabethan Act of Uniformity was passed, nine bishops voting against it the Third Prayer Book, thus introduced, met with little opposition, and led to the deprivation of only about 200 of the Marian clergy. Convocation had not been consulted. The consent of the Church can thus only be claimed by virtue of its subsequent acquiescence but from this time the history of the Prayer Book as a national institution may fairly be said to begin. That the authorities did not make a revision on the basis of the First Book was a profound misfortune for the Church; but considering what had happened in Mary's reign, the wonder is that the Queen in her wisdom was able to counteract the extremists as much as she did. England had indeed reason to be grateful to Elizabeth, in this as in other matters. Morning and Evening Prayer were to be "in the accustomed place," i.e. in the choir, instead of "in such place . . . as the people may best hear." 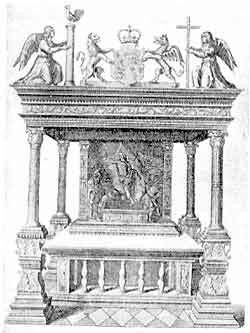 The next rubric of the Second Book, forbidding all vestments but the rochet and surplice, was superseded by the Ornaments Rubric, which brought back at one stroke the externals of public worship to the condition under the First Book (p. 71), ordering the minister to "use such ornaments in the church as were in use by authority of parliament in the second year of the reign of king Edward the VI." In the Communion, the ancient words of administration, "The Body of our Lord," etc., were restored: but unfortunately the sentence of the Second Book, "Take and eat this," etc., was left in as well, and thus the form became too long (p. 80). The Black Rubric was removed. The Prayer for the Queen and the Prayer for Clergy and People were added, but they were printed at the end of the Litany the mistake of setting the "State Prayers" (with that for the Royal Family, added in 1604) down for use twice a day was not made till 1662 (p. 128). The few other changes were of little importance : but it is a credit to Elizabethan statesmanship that, when the embers of Smithfield were hardly cooled, the petition to be delivered "from the tyranny of the bishop of Rome, and all his detestable enormities" was removed from the Litany. In 1560 the Prayer Book was published in Latin; and in the same year was issued the first of those Additional Services by which our worship has been enriched from time to time in succeeding ages. These have been mentioned on p. 49, but constant misapprehensions make it worth repeating that neither the Prayer Book itself nor the Act of Uniformity enforcing it prevent the use of duly authorized additional services. Under which Edward VI was buried. 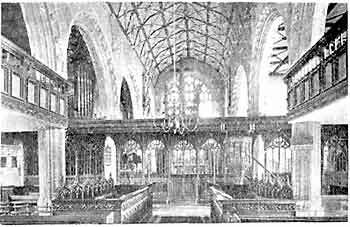 It was set up by Henry VIII, and was destroyed by the Puritans in 1643. The two pilasters which are seen supporting the ends of the altar were afterwards found, and are now restored to the present altar. In 1561 a Commission was appointed to revise the Kalendar, and the names of the black-letter saints, much as we now have them, were added. In 1562 the Forty-two Articles were reduced to Thirty-nine, with other changes. In the same year the Pope forbade his adherents to attend the English services, and in 1570 he launched his Bull of Excommunication, Regnans in excelsis, against Queen Elizabeth,and thus finally separated them from the English Church. In 1571 the Second Book of Homilies was issued. Meanwhile the Puritans struggled to have the Prayer Book altered, and many evaded its use. The return of the Marian exiles increased their power; and efforts were made, in Convocation and in Parliament, to abolish those beautiful and helpful ceremonies which stirred some men to a strangeness of opposition in this era of religious reaction. The sign of the cross in Baptism, kneeling at communion, the wedding-ring, every sort of vestment, including the black gown and college cap as well as the cope and surplice, were bitterly attacked. In 1562 a proposal in the lower house of Convocation to abolish these things, and also (incredible as it may seem to modern descendants of the Puritans) the organ, was only lost by one vote ; and this was in spite of the known determination of the Queen, whose decisive action indeed alone prevented the House of Commons from perpetrating that wholesale vandalism. 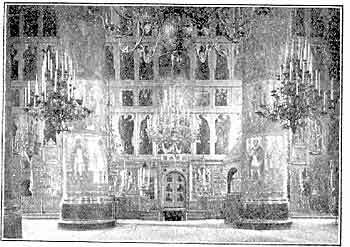 Showing the great ikonostasis, or screen before the altar. We cannot understand the subsequent history of the Prayer Book unless we realize the depth of this madness which fastened upon England — a madness which is only becoming extinct in the 20th century. It was the insanity of a wild reaction, a kind of Romanism turned inside out. Because the Roman Catholic Church (in common with the whole of Christendom up to the 16th century) acted on the obvious truth that beauty is a good thing, the majority of Englishmen paid Rome the compliment of embracing ugliness for her sake. They magnified Rome so much that they shaped their conduct by running into opposites. They threw away the wealth of popular devotion, which made her churches living houses of prayer with open doors and thronged altars, and which is still her real strength to-day; they did not know that such devotion had always been the note of all Christendom, and was (as it still is) even more marked in the Eastern Churches than in those in communion with the Pope. They thus set themselves against the mind of Christendom, as well as against one of the profoundest truths of God's universe — the inspiring virtue of beauty. They invented the notion that the devotional ways of fifteen hundred years and the use of any loveliness of symbolism in the service of God were connected with the autocracy of the Pope — a notion which would have been impossible even to their narrow minds, had not the Eastern Churches been in their time both weak and remote (for Moscow itself was in the hands of the Romanist Poles in 1610). They thus in their blindness presented to the Papacy an enormous reserve fund of power, which has served it ever after for whatever recoveries the Papacy has made since have been due Ä not to the peculiar doctrines of Romanism, not to the autocracy of the Pope, but to the fact that, in Western Christendom as a whole, men have believed that Catholic devotion and beauty in worship are a prerogative of the Papacy. As if the beauty of garments, or organs, or altars, or prayerful cathedrals, made by man, was more Popish than the beauty of the humblest flower which God. has made! Meanwhile in their theology many, both Conformists and Nonconformists, embraced the dark side of mediaeval teaching, which had been evolved from the worst part of the great Augustine's thought, and they developed it under the guise of Calvinism into a system which was an insult not only to the beauty but also to the goodness of Almighty God. They taught that God had predestinated the vast majority of mankind to the torture of never ending fire (how merciful the fires of Smithfield in comparison! ), not for any fault of their own — for, said the Lambeth Articles of 1595, "God from eternity hath predestined some unto life and reprobated others unto death," and "It is not placed within the will or power of every man to be saved." To-day, Churchmen and Nonconformists alike repudiate this ghastliest of all human lies. At the very height of the Puritan reaction there were men like Milton who were not Calvinists — Milton was indeed an Arian, and not therefore orthodox from either point of view. But, none the less, Calvinism was the creed that was set up against the teaching of the Church; Calvinism was the creed of the Puritan party, though indeed men like Richard Baxter held it in a modified form; and it was the power of Calvinism that was to bring King Charles I and Archbishop Laud to the block. Yet with Calvinism there were identified many great and noble things, and the struggle of Puritanism against royal absolutism was in its measure a struggle for human freedom. and because the Ornaments Rubric was increasingly ignored, an attempt was made in 1566 by the issue of so-called"Advertisements" to secure at least the minimum of decency — the surplice, hood, and cope, with the frontal and fair linen for the holy Table. At the present day the Anglican Church is the great standing witness in the West and in the new countries against the notion we have described — that devotion and beauty are a monopoly of the Churches in communion with Rome. It is for this reason that she is still so strenuously opposed from both sides. But her witness is to-day so evident because during the last two generations a movement, now practically universal in all parties, has been at work to revive the spirituality and beauty of worship, by restoring in some measure the orders and ornaments of the Prayer Book — such orders, for instance, as those requiring daily services and frequent catechizing. Showing the magnificent pre-Reformation rood-screen and pulpit, with the rood restored. But in the 16th and 17th centuries all this was not possible. The most the Church could do was to fight hard for the very idea of liturgical worship, and for a few things that preserved the principle of ceremonial, modest as they were — such as the surplice, the cope in great churches, the cross in baptism, kneeling for communion, the organ, the vested altar, and the wedding ring. They misjudge the Church of England who blame her because many of her churches still lack much that is good, devout, and beautiful. If she had not taken in nearly all her sail once, she would not have come through the storms at all. She had to let secondary things go in order that she might preserve the essentials of that holy spirit of prayer which is the heritage of historic Christianity. Now that the civilized world has at least come to see the inward power and outward beauty of catholic worship, she is able to set her churches in order again; and this is being done, not slowly. 1558. November. Accession of Elizabeth. 1560. First of many Additional Services issued. Day's "Partial Psalter," the Old Version (Sternhold and Hopkins), with some additional hymns, and the Queen's interim licence for private use. 1562. The Thirty Nine Articles. The Pope withdraws his adherents from the Church services, and thus begins the schism. between England and Rome. Day's "Complete Psalter," the Old Version as above, in almost its final form, with the Queen's seven years licence for private use. 1566. The Advertisements enforce a minimum of decency. 1566. The Old Version, as above, printed by Day with the Queen's licence, and "allowed to be sung of the people, in Churches, before and after Morning and Evening prayer: as also before and after the Sermon, and moreover in private houses." 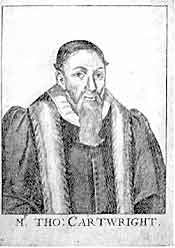 1571. Second Book of Homilies.